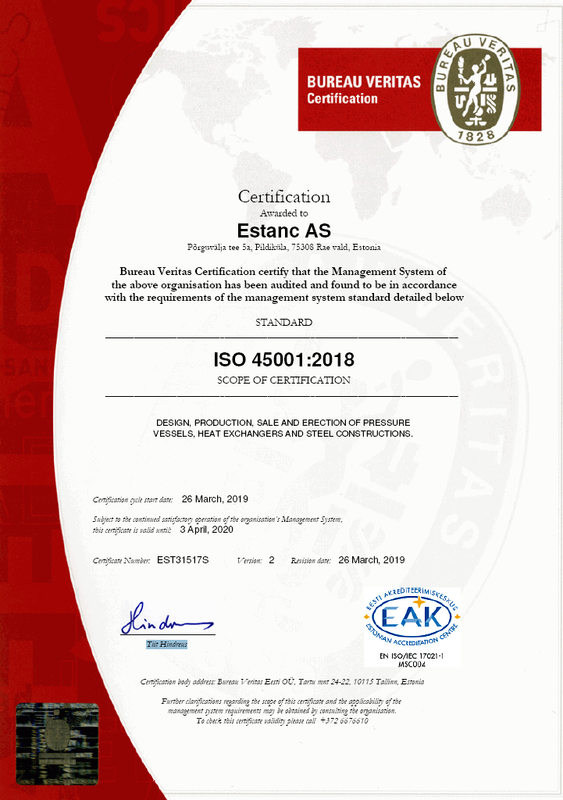 Estanc has received certification for compliance with the new ISO 45001: 2018 Occupational Health and Safety Management standard, which is issued by the Bureau Veritas Eesti OÜ after demanding evaluation process. ISO 45001:2018 confirms excellence and good practices in Occupational Health and Safety Management Systems and puts special emphasis on prevention systems and on the companies´ global commitment for the development of a culture of prevention and continuous improvement in this field. For this reason, it bases its focus on prevention management as well as on the co-participation of workers and managers in guaranteeing safer and healthier working environments. “A healthy and motivated employee is an asset. We take care of and value our people, assuring a positive employee experience and safe working environment. By implementing a certified H&S management system, Estanc proves to operate to the required standards and to be committed to the safety and health of our workforce, and we are proud of that,” says CEO Mihkel Tammo, CEO Estanc.